Conventional strategic management education is dominated by a strong industry recipe that: limits the number of perspectives presented; uses an overly simplistic step-by-step strategic planning approach; reworks original material into consistent and bite-size pieces of text; and leans heavily towards the authors' own domestic context in terms of the choice of perspectives, theories, examples and cases. De Wit and Meyer's Strategy actively challenges the educational orthodoxy to encourage students to be critical, and to challenge them to be analytical, in order to facilitate creativity and unconventional thinking. In this book, the fundamental differences of opinion within strategic management are not ignored or smoothed over. 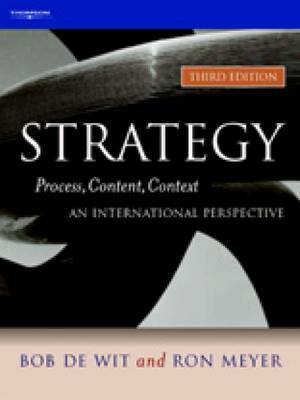 On the contrary, in this text the authors carefully guide the students through the many, often conflicting, perspectives in the field of strategy, in order to help them become true strategic thinkers.